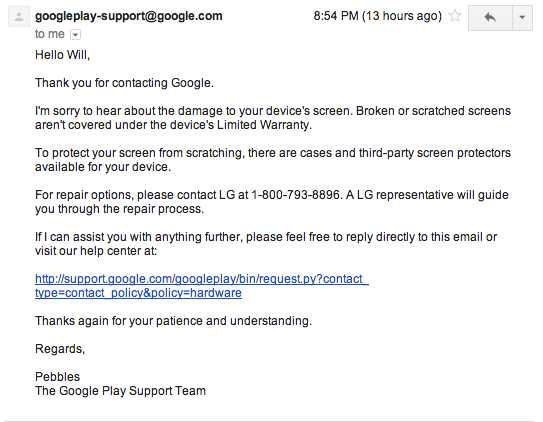 Shame on you Google/LG- Put your warranty where your mouth is!- RESOLVED! 2. 6 Weeks later hairline fracture presents itself in upper right front glass right by front camera. Without any abuse to phone (Drops or smash). Phone is used normally and even less since its not my main phone nor is it provisioned for voice. 4. Calls Google Play and told it is LGE who will provide out of warranty service. 5. Calls LGE and told it is out of warranty service and to send it in first i will find out costs later. 6. 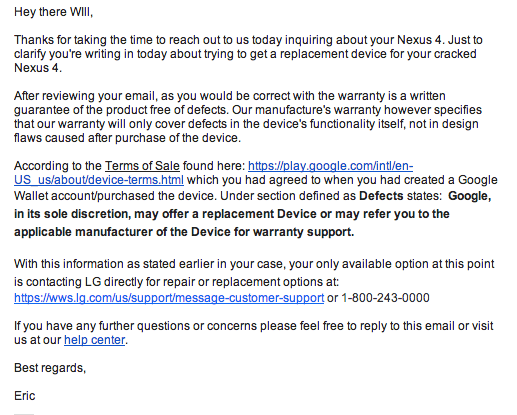 Calls back Google play and told glass is not covered by the Nexus 4's Limited Warranty. 7. I send email picking apart warranty and Google/LGEs possible violations of Consumer Warranty Act. 8. Filed in Small Claims Court against LG. I should be getting my Google Glass purchase invite any day now and being a gadget junkie I purchased a Nexus 4 from Google Play store for $300 to experience the full Glass as my daily phone is an iPhone5 on Verizon. I have been both an IT executive and Tech Hobbyist for over 15 years. I own tons of devices and have never experienced a phantom crack in glass. Sure Ive dropped devices before, some have taken the hit and some may have cracked. Hey I have 4 kids, Ive had ipod touches, LeapPads, laptops and DS' take abuse and get cracked screens. I usually have either purchased replacements or performed the repairs myself. In the case of my Nexus 4, Heres the story. I am in the middle of activating a prepaid sim on a great Tmobile pre paid plan to swap out my AT&T sim. I take off the Ringke case and notice a hairline crack in the upper right hand corner of the Front Screen right by the front camera. I proceed to check the camera and it doesn't work, I stay on the phone with Tmobile to activate my plan and figure I will call Google right after for warranty service. After activating the SIM card I try some testing of the Tmobile plan including sending some test text messages. (AT&T sims plan was data only, Tmobile is data/text and voice). I cant send the text messages as the touch screen is unresponsive at the exact screen part to send the text. At this point this is very weird and i perform further testing. So my phone and the hairline crack apparently affects the touchscreen at a certain touch point (middle right of screen) where it doesn't register touch. I proceed to call Google for warranty service. I explain my story to the Google Play rep who while very very nice, tells me I have to contact LGE and gives me their number. I contact LGE and as soon as I speak about the front glass she dives into a long process that I need to follow. I try to get some questions in but she rambles on. Finally I ask her are there any other options besides the one she mentions, which was: that i would have to send the Nexus 4 in, they would assess the repair costs and contact me at which point I can approve or decline the repair. I told her that this was not my fault but a defect with the material workmanship. She reiterates that that if purchased through the Google Play store that was my only option. Let me correct a couple of items here and explain my situation. I do have a Ringke fusion case on my Nexus device http://www.rearthusa.com/google-nexus-4-hybrid-fusion-case because of hearing all of the horror stories with the rear glass breaking very easily on this device. I had already contacted Google once and was told to contact LG who in turn treated me like the issue was automatically my fault. My issue is that I received a hairline fracture on my device through no fault of my own and that the material workmanship on the phone is defective. In searching the Google Play site I found this link about the nexus 4 warranty https://support.google.com/googleplay/answer/2851637?hl=en which says to contact google play support if the nexus was purchased from google play. In fact I have contacted them twice, both times told that glass damage is not covered by the limited warranty. I have read through the Nexus 4 warranty which can be found on LGs site here: http://www.lg.com/us/support/products/documents/Nexus4_SafetyAndWarranty_USG_Print_V1%200_121008-1.pdf and don't see that listed. If someone can maybe reference that in the actual warranty it would be helpful. Subsection 1: The warranty is 12 months in length beginning on the purchase date, which I am well within those 12 Months as my purchase was made on 04/18/13 and my incident is on 06/07/13. Subsection 3: I am the original purchaser and a resident of NJ and the incident and warranty claim occurred in NJ. Subsection 5: I can and have provided my information to accurately prove the purchase date. Subsection 1: I have only used the Nexus phone in the intended manner. Subsection 2: I have not done any of these items to lead to the hairline crack in the upper right corner of the front glass by the front camera at which I am attempting a warranty claim based on a defect in workmanship. 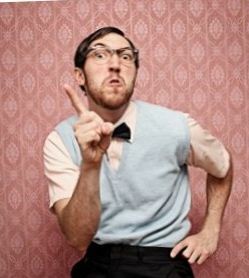 Subsection 4: I did notify customer service at LG and they told me to send the phone for out of warranty service with a fee merely because i mentioned it was the front glass. Subsection 7: I did not damage the phone with any accessories nor is this Warranty claim based on anything with accessories. Its based of a defect in the workmanship for my particular Nexus 4 Phone. Subsection 8: Nothing on the phone was damaged or scratched due to normal use. The damage was caused by a defect in the workmanship of my particular Nexus 4 phone. Subsection 9: Product was not operated outside of published ratings. Subsection 11: Claim is not about any consumables. http://us.lgservice.com is currently down with the following error: GCSC is impossible to access the external network. GSFS system or SCS system use. rights and duties under the state laws. In Closing as can be seen and has been outlined. I see no where that it makes mention that glass is not covered under the warranty. As a matter of fact the Magnuson- Moss act makes mention that the warranty is a written promise that the product, in this case the Nexus 4 phone purchased at Google Play manafactured by LGE, is free of defects or a written promise to refund, repair or replace defective goods. Of which remedies include damages for failing to honor a written warranty or service contract or for violating disclosure provisions. As a remedy to my warranty claim of a defect due to poor workmanship which led to a crack in the front glass of my nexus 4 phone, i am requesting a replacement phone be sent to me at no charge from Google Play as I purchased the product from you on 04/18/13. So Google passes the buck off to LG. I will reach out to LG on Monday again to see what is said. In the meantime I think I will just go ahead and purchase another unlocked android device outside of the Google Play Store and Not LG. Very disappointed in Google this week... More to come. I speak to LG and more of the same that it is not covered by the limited warranty. Again i reiterate this is not about trying to get a free replacement but about the fact that this is an obvious defect in the material workmanship of this particular device. I have tried a last ditch attempt to get LG to honor their warranty by reaching out to LG on twitter. If not I will just take it to small claims court on principal and purchase an unlocked android phone from a different manufacturer this week in anticipation of getting my Google Glass purchase invite anyday now. In a last ditch attempt to get this taken care of I reached out and spoke to @LGUS on twitter via DM. Pretty much the same message/stance that physical damage is not covered under the warranty. I have all the paper work done to submit the small claims court. Now I am on a crusade to prove LG/Google wrong, that there is a defect in the build process on these Nexus 4's, which lead to "Gorilla Glass 2" to cracks/shatters under "NORMAL" use not ABUSE. I will keep you all updated. Update 06/14/13: Officially filed in Small Claims Court against the Manufacturer for not honoring a written contract (The Warranty). I will keep updating this post on how things turn out! Update 07/05/13: Just received post card in mail for Small Claims Court date against LG for 07/19/13. LG has been notified as well. Update 07/19/13: Situation Resolved to my satisfaction.